1B1 is a progressive string ensemble founded in 2008. It unites musicians teaching at the University of Stavanger, their most accomplished students, and members of the distinguished Stavanger Symphony Orchestra. Its founder and artistic director is violinist Jan Bjøranger. In its short existence 1B1 has already collaborated with such outstanding performers and composers as Arvo Pärt, Clemens Hagen, Benjamin Schmid, Steve Reich, Tonu Kaljuste and Lars Anders Tomter. Martin Kuuskmann, Lars Anders Tomter and 1B1 bring you a Bach you've never heard before. Purists within the early music community; prepare to frown! We claim that this is a natural continuance of the practice from Bach's own time. Bach wrote 14 concertos for harpsichord in Leipzig around 1740. That is; they are most known as harpsichord concertos – in reality they are arrangements of concertos for other instruments written as early as 1708. 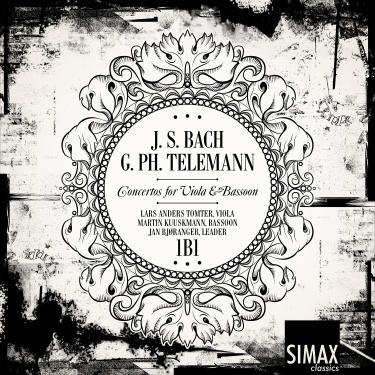 When working with the outstanding musicians of Collegium Musicum Bach re-worked his old concertos into new works, of course a completely standard procedure in those days. Continuing his pioneering work with the Mozart Clarinet Concerto and Clarinet Quintet in versions for viola, professor Lars Anders Tomter is joined by the outstanding bassoonist Martin Kuuskmann. Not only do they transcribe the solo concertos to fit their own instruments, they also construct a whole new concerto based on fragments and parts from other works! All in all much along the same lines which Bach and his colleagues did.